A female olive ridley sea turtle which was found stranded on an Oregon beach after the recent storms has died. It was taken to Seaside Aquarium where it was examined and then sent on to the Oregon Coast Aquarium for treatment. The turtle was active but hypothermic and was red on the underside. It also had an in jury to the front flipper. It was apparently a victim of the violent weather the week before. On arrival at the Oregon Coast Aquarium its temperature was 54 degrees. The animal was administered fluids and its wound was cleansed. The turtle eventually died despite treatment. According to Mochon-Collura of the oregon Coast Aquarium some turtles can survive and some cannot. Oregon State University will do a necropsy to find the exact cause of death and to collect data. It is not often that sea turtles are found on the oregon or Washington Coast unless they are stranded. That happens most often in winter after a storm. 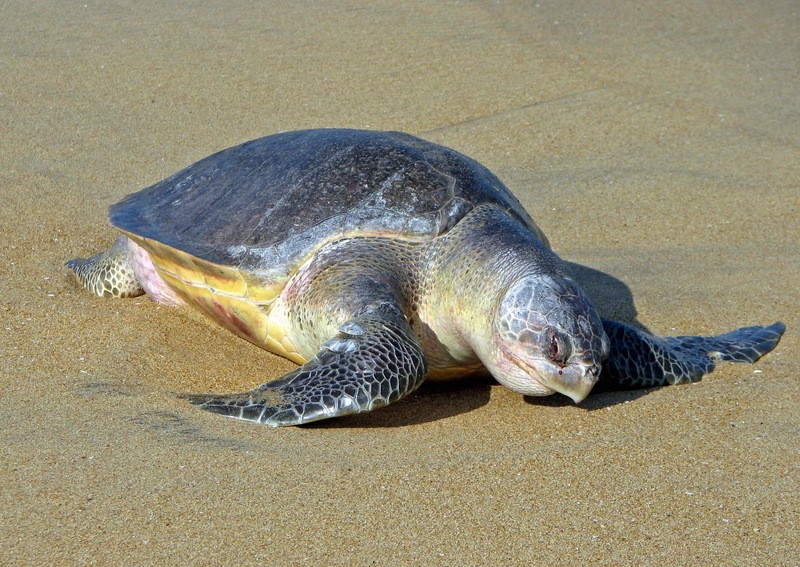 If you find a turtle on the beach you are asked to call Oregon State Police Tipline at 800-452-7888 or the Marine Mammal Stranding Network in Oregon, Washington, and California at 1-866-767-6114.